Enhanced Abilities: Chemo has superhuman strength and endurance. Body Armour: Chemo has some resistance to physical and energy attacks. Growth: Chemo can alter his height from 25' to over 100'. Corrosive Missile: Chemo can spew acid hundreds of feet at a target. Professor Ramsey Norton was a highly ambitious scientist who hoped to find solutions to humanity's greatest problems, including famine and disease. 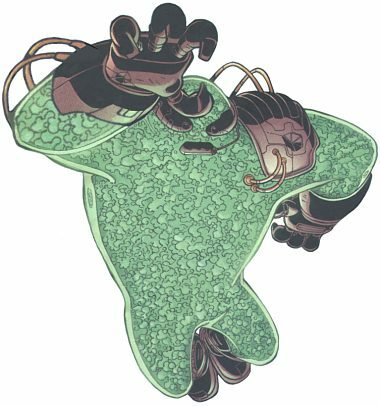 He dumped the results of his unsuccessful experiments into a gigantic humanoid-shaped plastic mould that he named Chemo. Chemo represented Norton's failures, and was supposed to spur him towards success. After failing to develop a plant-growth chemical, he poured the results into Chemo, filling it to the very top. Through a miraculous chemical reaction Chemo was brought to life, possessing a mild intelligence and a great need to destroy. Chemo killed his horrified creator, and then went on a citywide rampage.